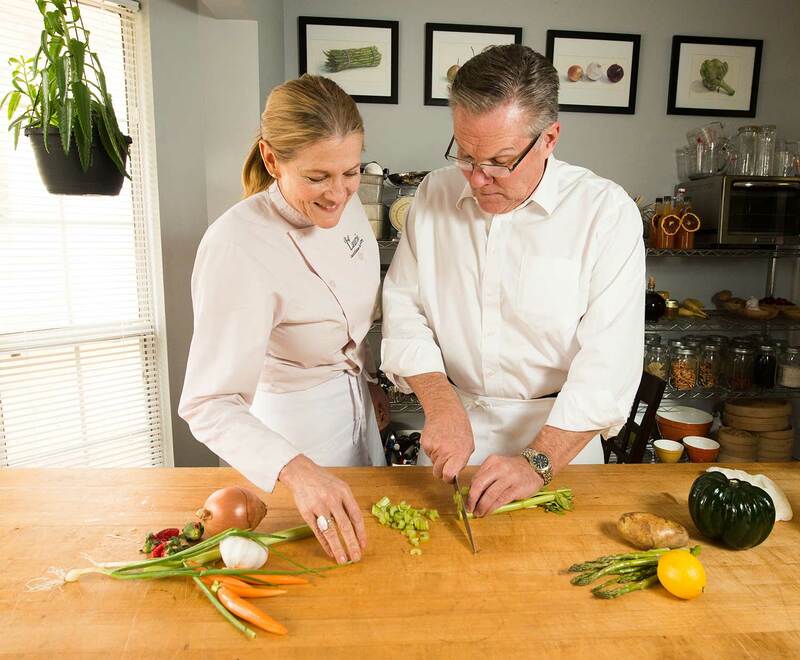 Extensive knowledge, a passion for health and wellness and an immense talent for inspiring others with her delightful and engaging personality are behind Chef Laurie Erickson’s success in her 30 years of professional cooking. Her admired talents have been showcased at some of the nation’s top resorts, from the renowned Canyon Ranch Resort and Spa in the Berkshires of Massachusetts (where she served as Demonstration Chef and developed the Resort’s line of signature breads and baked goods) to the Five-Star Cloister and Spa at Sea Island on the Georgia coast (where she served as Wellness Chef) . Chef Laurie’s passions are life-long. She began creating recipes as a young girl with her grandmother from whom she learned the powers of herbal remedies and the joys of organic gardening…she studied Nutrition, Exercise Physiology and Herbal Medicine while working as a professional chef…she is a certified fitness instructor and certified sports nutritionist. Her recipes and tips have appeared in Self Magazine, Spa Magazine, People Magazine’s Your Diet, Best Life Magazine, Men’s Health, The Boston Globe and Restaurant News. She has been the featured chef on the Dr. Oz Show, the Lifetime Channel’s show The Balancing Act and Travel Channel’s Epicurious cooking show, The PBS TV series On The Menu, and on the Tennis Channel. Dine in the privacy of your own home with an exceptional dinning experience with Chef Laurie Erickson. Chef Laurie specializes in intimate dinner parties for smaller groups. 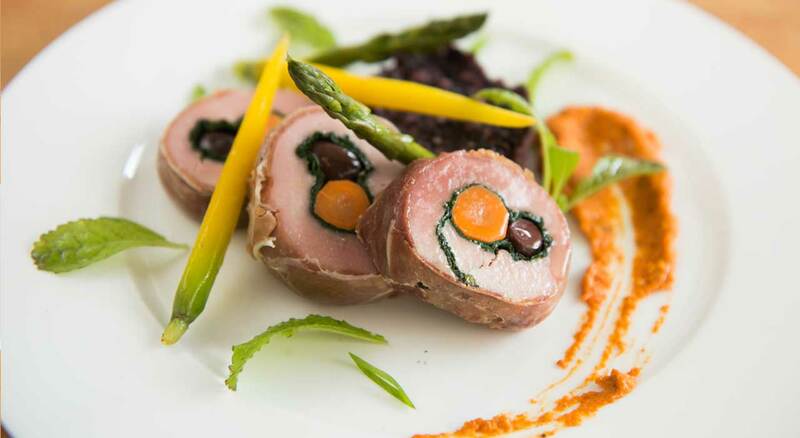 Excellent customer service and innovative cuisine is what Chef Laurie insists on. Whether it’s a sit down multicourse dinner, a special brunch, ladies luncheon or horsdoeuvres party, Chef Laurie is dedicated to using the freshest, most sustainable ingredients in all of her dishes. She customizes every menu to suit the palate and dietary needs of her clients, making each event unique and personalized. 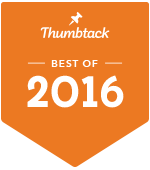 "Chef Laurie was voted "Best Private chef" in Charleston and consistently keeps her "Top Pro" status on Thumbtack. Her warm and friendly personality and attention to detail are what makes Chef Laurie the best choice for your small catering needs. Take a look at a few sample menus to get an idea of what Chef Laurie can do for your next event. "What a wonderful experience we had with Chef Laurie. She was very responsive and helpful in creating our menu before our dinner. She arrived on time, set up a wonderful table, and made us an absolutely delicious meal! If I'm ever back in the Charleston area and need a chef, I know who to call." "Chef Laurie was an absolute pro! She was so relaxed, laid back and took care of everything! The food was delicious and we were so happy with the whole night!!!! Thank you to Mickey and to Chef Laurie! Big thumbs up!!!" 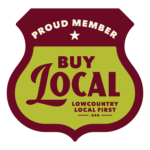 "Chef Laurie made my trip to Charleston! She was incredibly professional, fun, creative and she cooked an absolutely delicious meal! She was thoughtful in creating the menu and her presentation on the night of our event was world-class! I would highly recommend using Chef Laurie for your next event - it will surely be one to remember! 5 stars!" Chef Laurie has extensive hands-on experience working at the world class spa, Canyon Ranch in Lenox, Massachusetts and Sea Island Resorts in Georgia as well as several resorts and spas across the country. She created wellness programs for private groups, individuals, families and corporate groups. Each 90 minute class is specifically designed for you and your cooking level. Personally focusing on your specific needs. After a brief consultation, you can choose what types of foods you would like to learn how to prepare. The possibilities are endless, from fish to vegetables to breakfast foods. Whatever you want to learn. Also, if you or someone in your family has specific dietary needs, Chef Laurie can educate you on how to incorporate them into your daily diet. The classes can also include a pantry re-vamp as well as a trip to the grocery store for an isle by isle “buy this not that” tour. Relaxation and spa treatments are important . however, Fitness and Nutrition are at the very core of Wellness. In collaboration with the fitness staff, private groups participate in as little as a 3 day or full week program that treats the individual from the inside out. The program includes, fitness assessments, nutritional consulting, group exercise classes as well as healthy cooking demonstrations and hands on cooking classes. Live cooking demonstrations for 2 to 100 participants. An excellent and fun amenity Chef Laurie performs a 90 minute extremely informative and entertaining healthy cooking demonstration. Her down to earth attitude that is more about guidance than preaching. Chef Laurie’s demonstrations are an open forum for questions and answers through out the demonstration. Chef Laurie demonstrates several quick, easy recipes with only a few ingredients, not to many dishes and some that can be ready in 10 minutes! Demonstrations can include lunch, which coincides with the demo. Recipe pack and special gift from Chef Laurie are included. Local Wish Bone Farm pork loin, butterflied and stuffed with sautéed kale and garden carrots, served with a Spanish romesco sauce with a hint of smoked paprika. 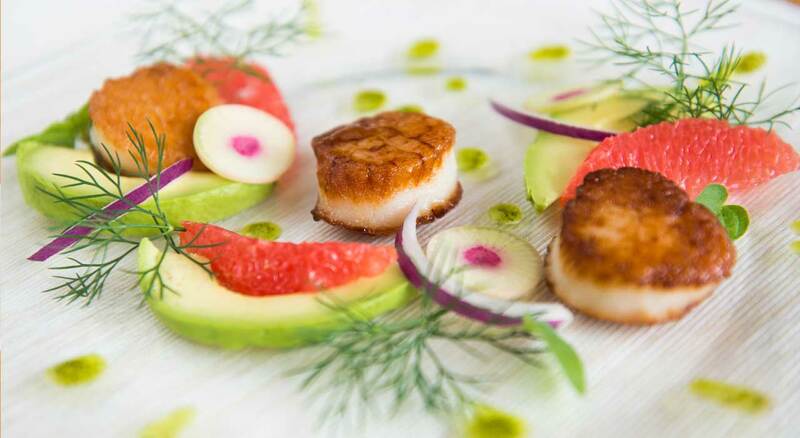 Mount Pleasant Seafood scallops, seared and served on a bed of fresh grapefruit, cilantro oil and watermelon radishes. 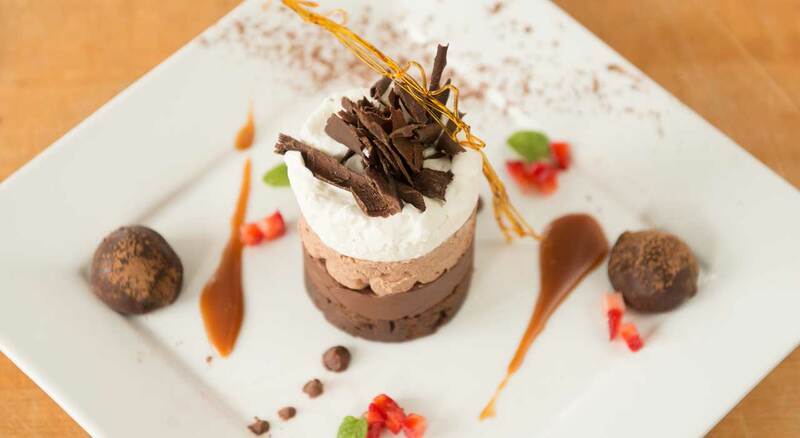 Dark chocolate cake topped with milk chocolate espresso mousse and whipped cream served with chocolate curls, caramel sauce and raspberry couli. Thank you for visting Chef Laurie.com. For more information about our services or to schedule an event, feel free to send me a message anytime and I will get back to you as soon as possible. © 2019 · Chef Laurie LLC. · All Rights Reserved.